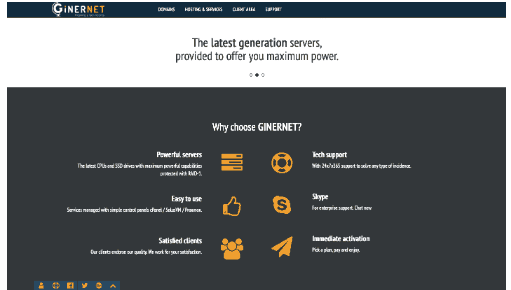 Ginernet Review 2019: Is Ginernet a Good Hosting? Ginernet offers shared hosting with SSD, a free SSL certificate, and Softaculous. However, a lack of an uptime guarantee and lower capacities will decrease the value for many webmasters. Ginernet is a Spanish web hosting company offering shared hosting and VPS packages from servers in Madrid, Barcelona, and Alicante. Support is offered in English and Spanish. Ginernet’s Spain-based servers are an intriguing option for e-commerce stores selling to the Spanish-speaking market but looking to maintain a European presence. The functionality for e-commerce is generally good. Shared hosting plans are exclusively Linux-based and come with a lot of what is needed to run an online store well — SSD storage, cPanel, a free SSL certificate, and support for Apache. Unfortunately, the SLA offers no availability guarantees — a major omission. Webmasters of large websites will have to gauge their own needs and decide if the location and feature list is worth the risk. Beginners can also find most of what they need here, but not everything. On the plus side, there is access to hundreds of one-click integrations including WordPress, Magento, and Drupal via the Softaculous installer. The downside is that no other website builder or setup service is offered, so true beginners will have to be comfortable using one of the mainstream options. You get two months of hosting free when you purchase a yearly shared hosting plan. Other billing cycles offered include monthly, quarterly, and semi-annual payments. Webmasters looking to run either a single mid-sized website or a network of small websites will find the most value here with the mid-tier plans. Although slightly more expensive than the average competitor, Ginernet offers between 10-20GB of storage and unlimited domains — also slightly more than competitors. Beginners will find the entry-level plans less advantageous. Capacities are similar to what comes standard with many CMS options, so there isn’t a need to pay more here. The WHM-2G does offer unlimited domains at a competitive entry-level price, but the 2GB storage cap means there isn’t enough power to take much advantage. Smaller e-commerce merchants may be able to get by with the 40GB storage capacity offered by the highest-tier plan. However, that’s a low number compared to what you can find elsewhere — and there is also a bandwidth cap of 4TB a month. Large e-commerce merchants won’t find any plan here with enough capacity for their needs. The VPS SSD plans generally offer good relative value compared to price. The problem is the total capacity is far below what you will find elsewhere — just 50GB storage space and 4GB of memory. Small websites that want some additional speed can check these plans out, but any medium to large-sized website need not apply. Support options are good. 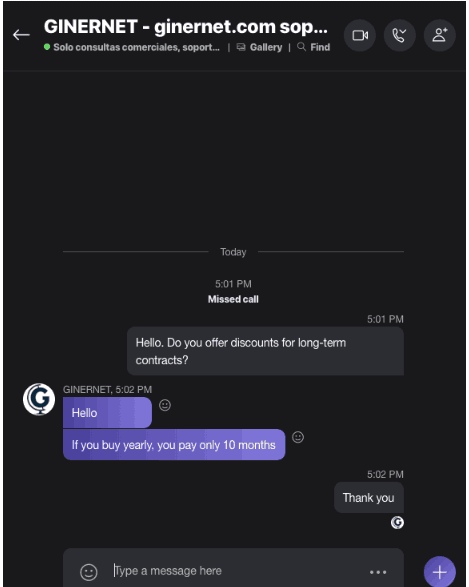 They are advertised as 24/7, and as you can see from the screenshot below, I received a reply via Skype live chat fairly quickly. TeamViewer support is also available if you need more hands-on technical help. There are also phone, email, and ticket options as well. A knowledge base does exist with answers to a few questions, but it is Spanish-language only. Ginernet is an attractive option to run a small network of websites that use minimal resources. However, lower capacities with the higher-tier plans and the lack of an uptime SLA undercut the value for larger websites. Wondering how Ginernet stacks up against other Web Hosting companies? Enter any other Web Hosting company and we will give you a side-by-side comparison.